Home › Energy-Efficient LED Lighting › Patio Umbrella Light Omore 3 Level Brightness Wireless 28 Led Lights At 100 L..
Patio Umbrella Light Omore 3 Level Brightness Wireless 28 Led Lights At 100 L..
OMore 28 LED Patio Umbrella Light This LED Umbrella Light is perfect for outdoor activities: BBQ, camping,playing cards, or lie on your leisure chair to enjoy the moonlight with lover.Suitable for most patio umbrellas and easy to install and remove You can hang it up Most patio umbrella light in the market can't be hung up, but this productsolves this problem. The rings design on the top of this light makes it easyto hang in camping tent or treehouse Full moon design, enjoy moon light everywhere The round shape makes it looks a full moon. The white light provided by thislight is bright but not dazzling, it looks like moonshine. It offers perfectdining ambience Compact and plate-sized This product is not bulky, the space- saving shape make it convenient tocarry. It is perfect for hiking, camping, motor home, etc Water-resistant The outer shell is made of advanced ABS plastic, so outer shell is anti-splash. (Due to batteries operation, it's not water-proof). In order to prolongits lifespan, please install it to the dry place Features: 3 modes of operation: Dim(Inner 4 LED bulbs); Bright(Outer 24 LED bulbs);Super Bright(28 LED bulbs) 2 lifting hooks: Can be hung everywhere and convenient carrying Batteries operated: 4 AA batteries operated (not included). 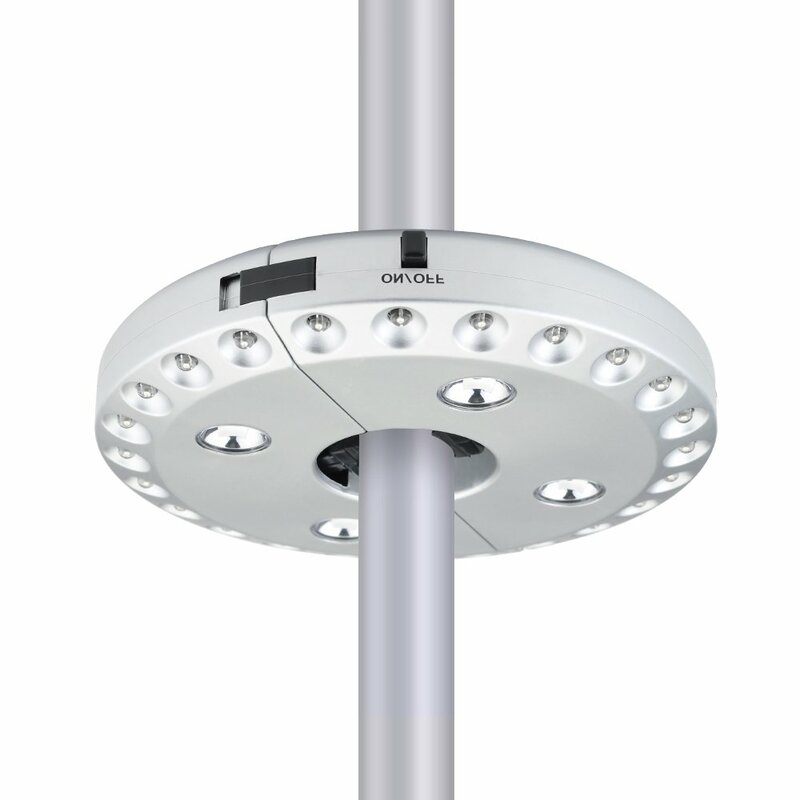 No need tohookup any wires, without unsightly wires hanging from your umbrella Specification: Output Voltage: 4.5V Power:0.5W Luminance: 100lum Material: ABS plastic Product dimensions(LWH): approx 6.3in6.3in1in IP grade: IP44 Effective Lighting Duration: approx 30h (alkaline battery); approx 15h(zinc-manganese dry battery) Package Contents: 1x Patio Umbrella Light 1x User Manual Warranty: 45 days money-back and 12-month, worry-free Guarantee!